My husband wonders why I don’t just wait to race and qualify next year like I planned. I didn’t look for this opportunity. I’ve raised tens of thousands of dollars for charity in connection with IRONMAN and other races. I’ve qualified for Kona twice. I’ve spent countless hours encouraging and supporting women in our sport for nothing more than the pure joy of it. I did not seek out this opportunity. I didn’t expect it, but when it was presented to me something about it felt right. The opportunity to raise money to further the every day woman’s chance to live a happier and healthier life through triathlon? To me that’s a win / win situation. And all it will take is for me to train to the best of my ability, be presented with a good day on October 10, and find 177 friends to support with $1 per mile . . . or more if you are so inclined! After conducting national research to determine the greatest barriers to women’s participation in triathlon, members of the Women For Tri board identified a need to support female athletes at the local level and to create an interactive source of information and resources for female athletes. Towards this goal, three volunteer board members will participate in this October’s IRONMAN World Championship in Kona in partnership with IRONMAN Foundation, with the aim of raising $75,000 to achieve these goals. The board members selected to race for Women for Tri at this year’s IRONMAN World Championship include Katherine Kelly Lang, Kyrsten Sinema, and Moira Horan. Lang, an age-group triathlete from California, has competed in two IRONMAN 70.3 events. She is an original cast member of the most watched daily drama in the world, The Bold and the Beautiful and is also an Emmy® award-winning producer. In addition to being a competitive athlete and an actress/producer, Lang is also an Spokesperson and Ambassador for Breakaway from Cancer. Moira Horan has competed in countless triathlons since 1993, including qualifying for and competing in Kona. She is a certified USA Triathlon coach in New Jersey, founder of the Jersey Girls StayStrong Multisport Club, and co-founder of the Jersey Girls Triathlon. She also raced for FDNY-related charities at all her previous IRONMAN events. Kyrsten Sinema, age-grouper from Arizona, is the first sitting member of Congress to complete an IRONMAN competition—and possibly the first athlete to be knocked off a bike by a tumbleweed. Sinema races regularly for charity, including the Martin Richard Foundation and OneFund Boston (the Boston Marathon charity). Frequently asked questions about Women For Tri’s fundraising efforts. 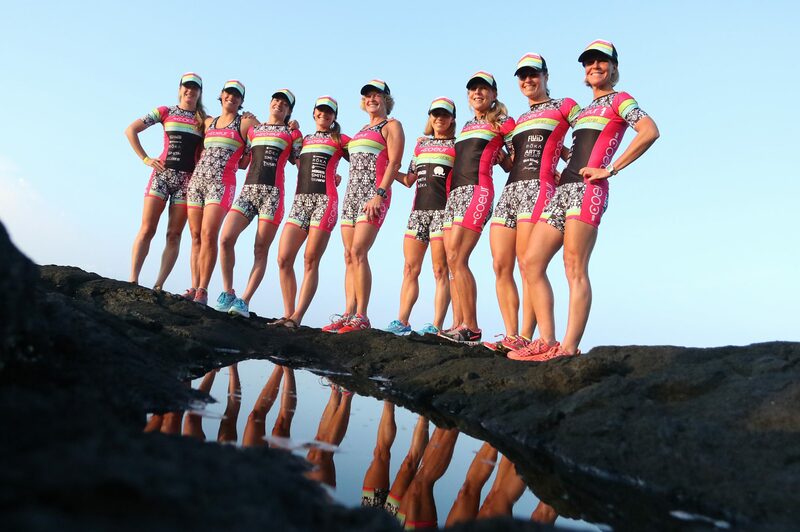 The Women For Tri board is fundraising through The IRONMAN Foundation’s Fundraising platform—hosted by Crowdrise and Network for Good (two third party fundraising platform providers). Crowdrise charges a 3 percent fee which the IRONMAN Foundation will cover so that 100 percent of every dollar raised will go back to the Women For Tri grant funds. Women For Tri’s mission: To identify and diminish primary barriers to entry and mobilize triathlon advocates to encourage and engage female athletes across all distances and representing all athletic abilities. The IRONMAN Foundation’s mission: To leave IRONMAN’s legacy through philanthropy, volunteerism, and grant making, by supporting various athletic, community, education, health, human services and public benefit organizations around the world.